There are many knowledge base, wiki, FAQ, and support WordPress themes designed specifically for this purpose just as there are knowledge base plugins. The themes featured on this list will help you craft an original and contemporary website that your visitors will find easy to scroll through in order to find the information they need. Depending on the theme you choose you will have a variety of homepage demos, page templates, plugins, and features. All of these themes are also responsive and search engine optimized. Before choosing a theme from this list you should take into consideration and needs and design expectations to make sure it meets them. 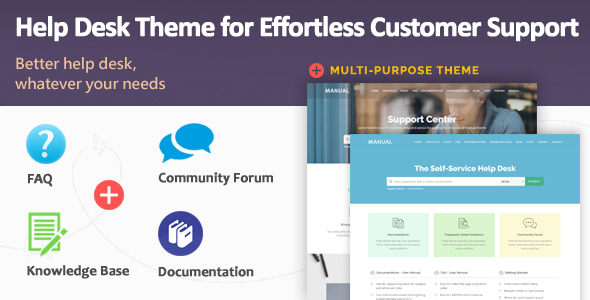 Many of the knowledge base, wiki, FAQ, and support WordPress themes featured in here will come with FAQ page templates, support tickets manager, systems for questions and answers, and other specific tools. Take it all into account to help you decide on the best one for you. 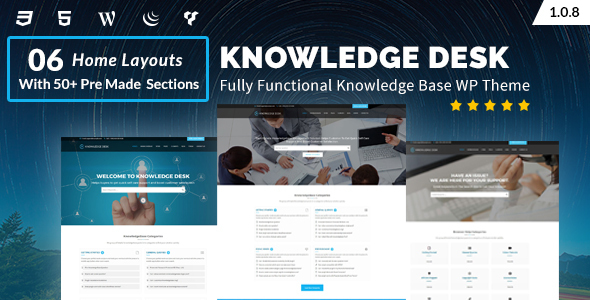 Knowledgedesk is a knowledge base, wiki, FAQ, and support WordPress themes that will turn any website into a popular online choice for people looking for information. Once you install Knowledgedesk you get to choose between 6 pre-designed home pages specifically created for this type of website. This theme is integrated with two powerful plugins: Visual composer and BWL knowledge base manager offering you the opportunity to create unique layouts. Try Knowledgedesk today! Great knowledge base, wiki, FAQ, and support WordPress themes can be hard to find, but Manual is one of them. Using Manual you will have the necessary tools to build a refined and intuitive platform for your business. With Manual you can choose one of the already designed and crafted demos, customize your portfolio style, create a shop page, add a slider and design elements, target search, provide immediate answers, switch the header, and translate your content. Furthermore, Manual has a responsive layout that looks just as beautiful on any device. Seeing as this list features the best knowledge base, wiki, FAQ, and support WordPress themes we could not leave out Discy. This theme is well organized and easy to use featuring filters, live search, social media integration, voting system, best answer tag, add a question submission, questions manager, polls creator, user points and badges system, statistics, and RTL support. 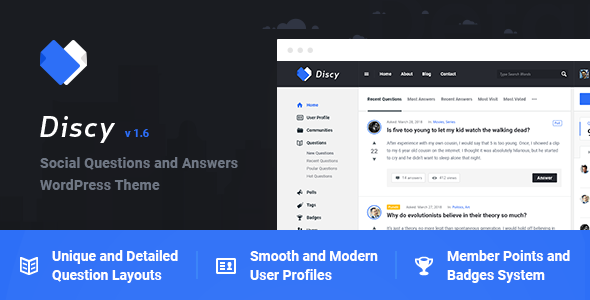 Discy is the best platform to manage your support tickets and questions while also encouraging visitors to be active and inquiring. 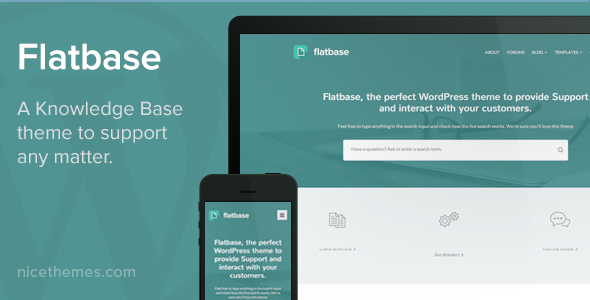 Flatbase is a flexible and responsive knowledge base, wiki, FAQ, and support WordPress theme. Flatbase incorporates a one click demo installation that makes a few seconds to import. You also get access to various pre-built demos, article layouts, knowledge base, instant answers, article feedback, FAQ templates, and bbPress. This theme also has a gorgeous and responsive design tested to adapt to all devices. Step up your game with Flatbase! As far as knowledge base, wiki, FAQ, and support WordPress themes go InfoCenter has all the tools necessary combined with a lovely layout. InfoCenter comes with a FAQ page template, best answer tag, report option, user profile page, 10 custom widgets, video integration, related posts, SEO optimization, multilingual support, and a proper documentation. If you use InfoCenter visitors will easily find the information they need! 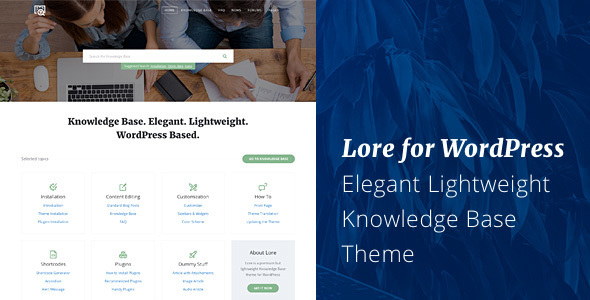 Lore is a knowledge base, wiki, FAQ, and support WordPress theme which means it comes packed with features ideal for this type of website. With this popular theme installed you will create your own custom layouts and design elements showcasing your services and creating long-lasting first impressions. Lore has search forms with filters, custom content types, bbPress forum, page templates, unique color schemes, mobile friendly layout, and SEO optimized code. If you are looking to create a pristine website then Lore should be your first choice! 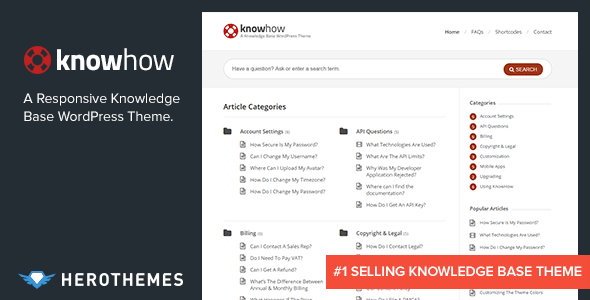 Knowledge Base is a knowledge base, wiki, FAQ, and support WordPress theme that is regularly updated and improved to fit more needs. This theme does not have a bold design but it does come with plenty customizations and tools. 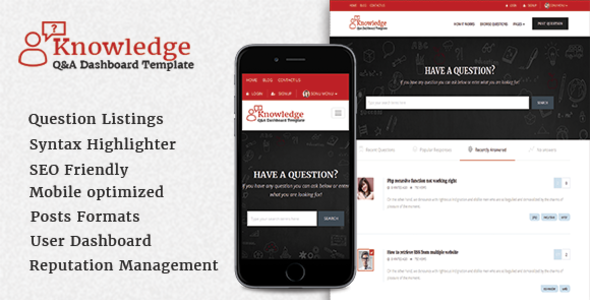 Knowledge Base provides a live search, bbPress support, 4 color skins, 3 homepages demos, page templates for various uses, custom widgets, shortcodes, and a child theme. Knowledge Base allows customizations through its theme options panel giving you the ability to create a unique look for your website. It’s very easy to create a website from scratch with Knowledge Base! 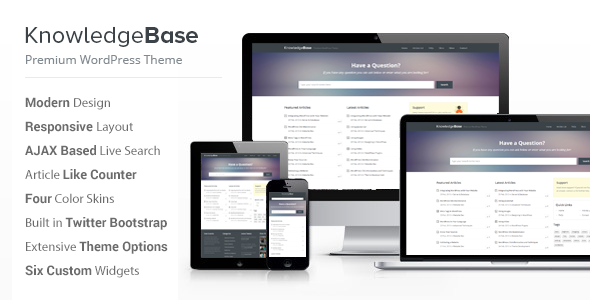 kBase is a cool and stylish knowledge base, wiki, FAQ, and support WordPress theme. By choosing this theme for your website you will get access to 7 unique and creative demos, 3 banner styles, 6 search types, a page builder, 6 footer styles, 500 shortcodes, 4 image carousels, 22 accordions, 15 buttons, 4 custom posts, and 5 progress bars. Combining these elements will allow you to create an original layout that molds after your business. 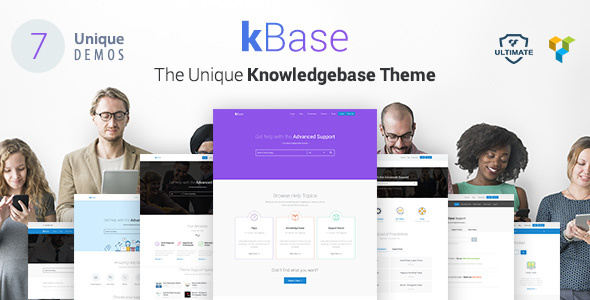 If you want to build a website that contains a knowledge base then kBase is the theme for you! TicketLab has been developed specifically to help people create website that contain knowledge bases, wiki info, and FAQ pages. This theme comes with all the perfect features a website like that needs to deliver. This means that with TicketLab you get a support tickets manager that allows you to prioritize, assign, and categorize tickets. Apart from that you also get multilingual support in 6 languages, drag and drop page builder, SEO optimization, Zendesk synchronization, social media login, knowledge base feedback, code checker, and a responsive design. Build an attractive website with TicketLab! TechDesk gives the option of offering the best to your visitors in terms of design and functionality. 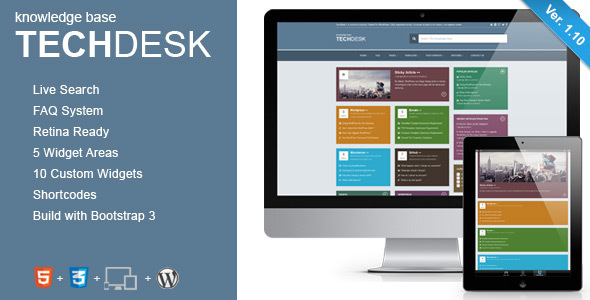 TechDesk is a highly customizable theme that includes a FAQ system, live search, 9 helpful widget, several widgetized areas, 5 post formats, unlimited homepages, and a sleek layout. While this theme might be a bit on an oldie, it still holds its ground among all the new Knowledge base, wiki, FAQ, and support WordPress themes. Check out its live preview to see if TechDesk is the theme for you! 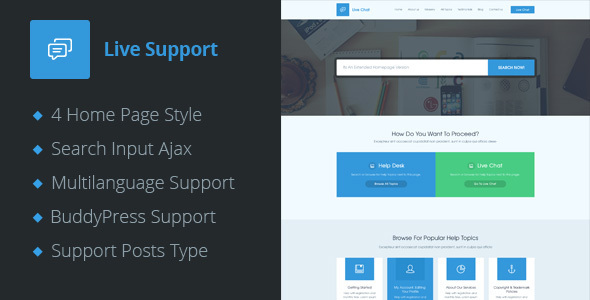 Live Support is a support ticket WordPress theme that has been crafted to make customer support representatives’ lives easier. Live Support features a pristine and fresh design combined with interactive and attracting elements. With Live Support you have 4 homepages, live search form, multilingual support, BuddyPress support, flat icons, carousel slider, testimonials, and a ticket system. To help promote your website and services, Live Support is fully SEO optimized. Try Live Support! 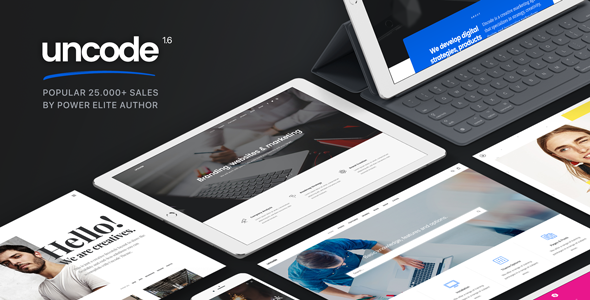 Uncode is a multipurpose WordPress theme that has been crafted to fit various needs. The visual design of Uncode is modern, professional, and original making it a great platform to promote services and products. Uncode has a responsive design that allows visitors to access the website from all mobile devices and popular browsers. Other features of Uncode are 16 portfolio styles, carousels, sliders, 8 menu layouts, typography options, RTL support, SEO optimization, sticky menu, custom icons, and much more. Uncode does not lack in options – try it! KnowHow includes lots of amazing features that will make your website popular. KnowHow gives you the ability to have a responsive layout, provide instant answers, add FAQ pages, rank better on search engines, translate your content, add videos, add shortcodes and custom widgets. There is no reason why not to try KnowHow out and its knowledge base, wiki, FAQ, and support ticket features. KnowHow is continuously being updated and enhanced making it a great choice for your website. 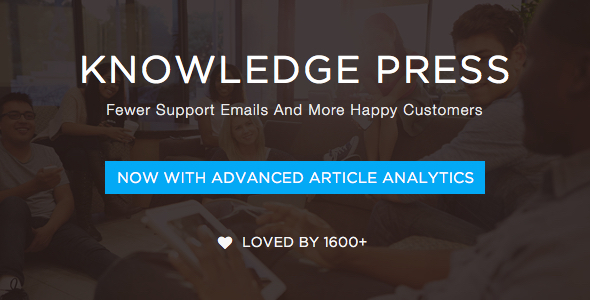 The inventors behind KnowledgePress created it with a single purpose in mind: to help decrease support emails by adding a knowledge base users can browse through and solve their issues in mere minutes. 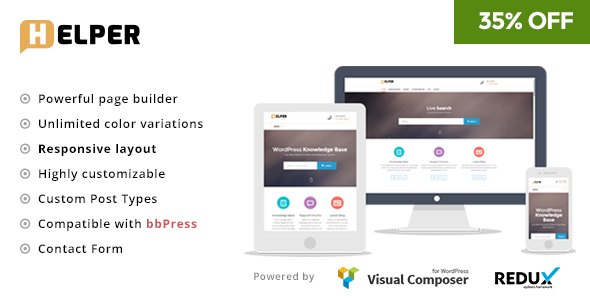 KnowledgePress includes a drag and drop page builder, drag and drop ordering of articles, breadcrumbs, FAQ pages, live search widget, search analytics, voting option, and other customizations. KnowledgePress makes it beyond easy to craft a knowledge base website thanks to its intuitive admin panel. Deliver only the best solutions with KnowledgePress! Iknowledge is stunning, chic, and simple knowledge base, wiki, FAQ, and support WordPress theme. Iknowledge is flexible enough to be used for various businesses but will mold perfectly on a knowledge base website. Browsing this theme you will notice that it was built to include many options such as a powerful page builder, unlimited color variants, bbPress integration, shortcodes, contact forms, custom page templates, custom widgets, and a simple demo importer. No matter the kind of website you are developing, this theme is worth a look. As far as knowledge base, wiki, FAQ, and support WordPress themes go this is one of the best! Ticketrama has been created by BigBangThemes, a popular elite ThemeForest author. This theme focuses on knowledge base, wiki, FAQ, and support tickets websites and comes with plenty of design options. Ticketrama is responsive and comes integrated with a complete ticket system that will solve all your customer support issues. The theme options panel gives you full access to customizations and it is up to you how the final product will look. Helper has a clean and outstanding design that makes any website look good without overbearing it with features and elements. Thanks to its theme options panel and tools you can customize it completely in order to fit your vision. The demo data comes included with Helper making it easier to set up your website and get it up and running. Other features of Helper are dozens of typography options, limitless colors, child theme, Facebook open graph, custom backgrounds, and a mobile friendly design. Choose Helper! What are your thoughts on these knowledge base, wiki, FAQ, and support ticket WordPress themes? Are they up to par with your requirements and needs? If you happen to know a theme that deserves to be listed here be sure to let us know!